Water levels on all fisheries in the region have reached a worrying all time low for the year. 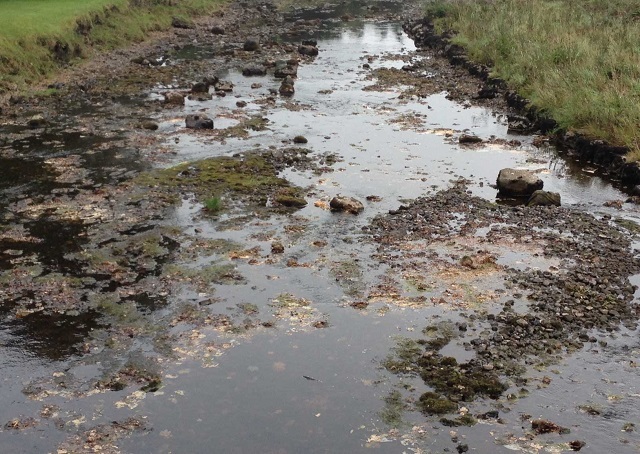 Most spate rivers suffer extremely badly from theses exceptional low water conditions and the drought also impacted heavily on the bigger systems such as the Moy or Ballisodare. As a consequence, angling effort is very low these days with only very few venturing out salmon fishing. However, some visiting anglers from France who were persistent enough caught a few fish on the River Moy's Rinanney Fishery. Other successful visiting anglers included Richard Stevens, Northern Ireland, who had one fish on spinner on the Colcroonan Fishery and Frenchman, Eric Fabre, who landed a 5.5 lbs. grilse on prawn on Gannon's. Quite worrying - a North Mayo spate river showing its bones. Unfortunately, prospects for the remaining two weeks of the season don't look great as there is no significant change in the weather expected. Despite the extremely warm and calm conditions, Loughs Conn and Cullin produced some surprisingly good results for anglers during the week. Not many anglers were enticed by the bright conditions and there wasn't much sign of any fly life but the few who ventured out were rewarded with fine catches, mainly on dry flies and Daddy Long Leg and Hopper patterns. 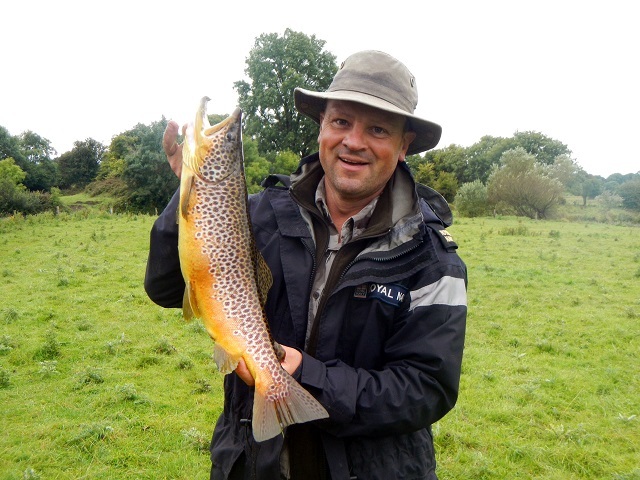 On Lough Cullin, local angler, Paul Caslin, boated two fine trout including a cracking fish of 3.5 lbs., while Ruarai McDermott together with his boat partner, David Farrley, both Galway, had 6 trout together, best at 1.5 lbs. Fishing out of Pontoon Bridge Hotel (relax@pontoonbridge.ie), a French party of three had 11 trout between them, best at 2.2 lbs. The French anglers also caught 2 salmon on Green Peter patterns. Donegal anglers, Sean Graham and Killian McSharry caught 5 fish up to 1.5 lbs. around Glass Island on Green Peters and Bibio Hoppers. Gerry Murphy Boat Hire (gmurphyboats@gmail.com) reported good fishing in Victoria Bay and around Massbrook Head. William Padden and Dickie Moore from Northern Ireland had eight trout, best at 2 lbs., while Gerry Sullivan, Kells, and Tom Weldon, Louth, boated seven, best at 2 lbs. On North Conn, a group of Welsh anglers caught and released 18 "keepers" over two days all on traditional wet flies. Other successful anglers on North Conn included Markus Schaffner and Roy Buhler, Germany, and Lindsey Robinson with his boat partner, Bryan Kersley, from Cork. Mayo's strong fighting pike "saved" the holidays for a group of German salmon anglers from the Rhine-Ruhr region. The group of 11 anglers attended a flyfishing for salmon workshop on the River Moy organised by group leader, Rolf Renell. When salmon angling conditions deteriorated further and the anglers still hadn't connected with a salmon, their guide, Paddy McDonnell (bluecharm@ericom.net), decided to take the group out flyfishing for pike on a number of nearby lakes including Levally, Conn and Cullin. It didn't take long before the first pike was hooked, played and safely released. For some members of the group it was their first experience flyfishing for pike, others had flyfished for pike before at home in Germany and in Sweden. However, everyone in the group was taken by the fighting spirit of Irish pike and stated that these pike were the hardest fighting pike they ever had fished for. The group landed over a dozen pike including some trophy fish well over the magic one meter mark, and it was group leader, Rolf Renell, who managed to land the biggest fish of the week - a fine pike measuring 115cm! 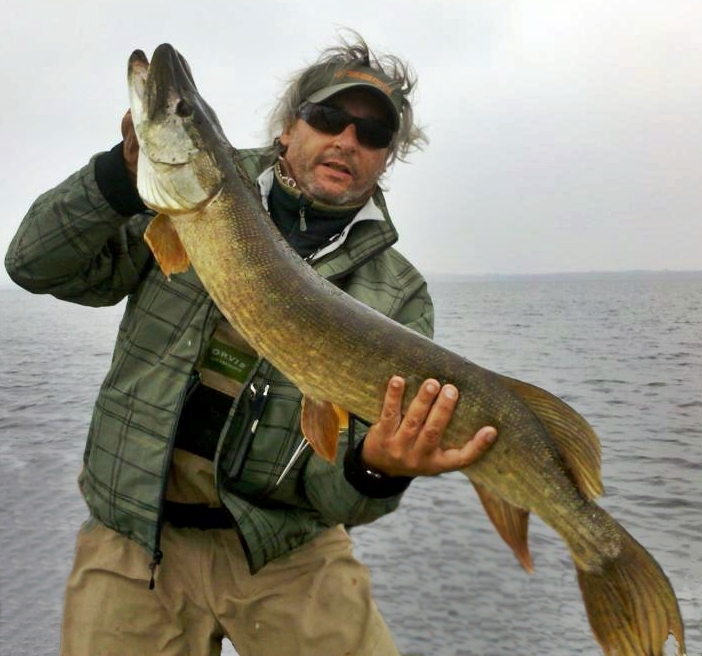 Group leader, Rolf Renell, with one of the many hard fighting Mayo pike the German anglers caught. Having experienced the fantastic sport flyfishing for wild Mayo pike can offer, the group is genuinely considering visiting the Foxford region twice a year from now on: in summer to fish on Ireland's most productive salmon River, the Moy and in autumn to hunt for Esox Lucius! Not much to report this week, as the long period of high pressure, slack winds and zero rainfall has made for difficult fishing conditions. Rivers are at very low levels, while the slack winds have made lake fishing difficult too. The Galway Fishery has been closed to fishing for a number of weeks now, as low water conditions upstream resulted in all the weir gates being closed, with just a small compensation flow through the fish pass. There is more rock than water visible in the river at present, and with the dry weather set to continue, there will be no more salmon fishing at the weir this season. Ronan Cusack reports that there wasn't much activity around the shores of Lough Mask over the past week, mainly due to the tropical weather we have been experiencing. Conditions all week have been virtually flat calm with occasional light easterly breezes which was reflected in the low turnout of anglers. Tuesday and Wednesday last saw the 13th annual Licensed Vintners and Friends wet fly competition held on Mask. This event is organised from Burkes Bar and Restaurant, Clonbur and was supported by 136 anglers. A total of 45 trout weighing 66.83lbs were weighed in over the 2 days. First place went to Cork angler Frank Long with 4 fish for 6.27lbs. In second position was Eddy Harte, Sligo, with 2 trout for 5.85lbs. Third prize winner was Galway man Mike Keady with 4 trout for 5.08lbs. Heaviest fish also went to Eddy Harte with a fine trout of 3.22lbs. This year's top vintner was Pat Bannon from Co. Cavan with 1 trout for 1.35lbs. UK angler Simon Jones and his young son had the surprise of a life time this week as they walked their dog along the banks of the Robe River. Simon stopped for a break downstream of a bridge and out of interest flicked a small spinner across a pool to see if he could entice a take. After a couple of casts a fabulous trout of approximately 6lbs almost pulled the rod out of his hand. After a long battle, the lads eventually landed the trout and in true sporting fashion photographed it and returned it to the water. Simon Jones with a fine 6lbs trout from the River Robe. taken on a small spinner. The fish was sportingly released after a quick photograph.